Distributor: R1 DVD from Sentai Filmworks, based on an old Geneon release. Notes: There's also a manga by Haruka Aoi (with art by Koge Donbo), published by Kadokawa Shoten. In this case, though, the manga is based on the anime. Saga Bergman is a girl who lives by a strictly planned scedule, and even being late at one of her appointments is just unthinkable. However, after helping out a little apprentice fairy at the brink of starvation by feeding her waffles, she will find that determination challenged. Sugar, the little apprentice in question, is searching for a twinkle. She doesn't know what a twinkle is, so her search is sporadic, to say the least, and it's about to throw a huge monkey-wrench into Saga's carefully planned scedule. I think one of the funniest things about growing up is that you will allow yourself to watch things you wouldn't be caught dead watching when you were a (late) teenager. 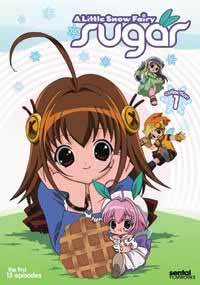 Sugar, a Little Snow Fairy, is one of those shows that had me snort derisively whenever its trailer ran on some of my other Pioneer DVDs, a trailer that consisted mainly of the intro animation and its somewhat grating song. And speaking of artistry, did you know that the creators of this anime went to the German town of Rothenberg to take pictures and do research for this show? Apparently, Muhlenberg -- the city which Saga lives in -- is based on this town, which gives the anime a distinct European flair, all the way down to how the schools are run. Of course, the show takes a few artistic liberties, like having Saga's mother, Ingrid Bergmann, be a famous pianist when she really was a famous actor. But then, Sugar, a Little Snow Fairy is basically mostly fictional, so it's not a big deal. Through this, music also plays a big part of Saga's life, and, by extent, the show itself. We eventually learn that the reason why Saga is working so hard and keeping so diligently to her scedule is because she wants to buy her mother's old piano back. Far as I can remember, the show didn't really go into why they needed to sell it, which is the only disrephancy I can think of regarding this show. Saga and her grandmother don't seem to be in any dire financial straits, so I thought it would make more sense for them to keep the piano since Saga loves it so much and even desires to follow in her mother's footsteps. If there were any explanations, then I must have blinked and missed it. But we can't go into this show without also talking about the fairies, which are the second half of the main cast. When Saga first meets Sugar and saves her from her own hunger, we are introduced to a tiny little weather sprite with the single-mindedness of a gnat and the attention span of a four year old, which basically makes her Saga's polar opposite. She's also voiced by Reba West in the English version, and Reba really dug out her most cutesy voice for the little snow fairy in training. She literally out-squeaks her other roles as Pai in Streamline's version of 3x3 Eyes, or even more famously; Minmei in Robotech. To make matters worse (mostly for Saga), the fact that Sugar is actually seen by a human being is not lost on her, so she literally throws herself on Saga and spends a few episodes making her life a living hell. Or... well, at least a little bit of hell. And things sure doesn't get any easier once Sugar's friends arrive on the scene. One thing I really liked about this show is that, while most -- if not all -- of the cast could probably be thought of as "good people", nobody is perfect. Even Saga herself can and will say or do some pretty hurtful things when her stress levels build up sufficiently. People in this show are allowed to stumble and fail without it feeling like a contrived setup to fish for sympathy for the characters. Even Sugar, obnoxious as she is -- hoo boy, you have no IDEA how much -- eventually grows up and starts paying attention to what she's doing. Another thing I really liked about this show is that, despite the many childish antics you see in it, it's a fairly mature show. Yes, it's a very idealized community, where everybody knows your name and bad words are rarely spoken about anyone. In fact, the closest thing this show has to a "bad" person is Gretta, the resident rich girl, who is also shown to have a heart under her status symbol veneer, though she will deny it with a fervor that matches even the biggest tsundere. But underneath it all, you will find a story about what it means to grow up, how to balance fun and games with the responsibilities of adulthood, but also about when to let go. And lastly, one of the lessons is that, sometimes, a "twinkle" isn't quite what you might first think. It's presented in simple ways for the benefit of the younger generation, true, but not so badly that it'd turn an adult off the show altogether. It's going to take a few episodes for the serious parts to start, though, so the older generation might want to apply some patience until then. Yes, Sugar, a Little Snow Fairy is mostly a childish show, but if you're a parent whose child hasn't completely succumbed to the screaming, mindless, typical shounen-for-children's shows (and its excessive merchandise), then both you and your children might be able to appreciate Sugar, a Little Snow Fairy. Recommended Audience: Well, there are explosions. No, really. See, one of the boys in Saga's class is a would-be inventor who lives for doing experiments, most of these leading to an explosion of some kind. Ok, so that was a poor example, but this show really doesn't have much in the way of objectionable material. All of the bath scenes are so foam-filled and chaste, I'm hard pressed to think of it as fanservice. There's also a complete lack of anything resembling violence, so the closest I get to "objectionable material" is when the character says some pretty hurtful things to each other.